Step into Spring with this great selection of new kids fiction from your Library! “During a service at Yorke’s Cathedral, a young boy bursts in, declaring that his sister has been kidnapped. Soon Rose finds herself tangled up in a mystery involving fake antiques, a maodorous factory and a secret society of chimney sweeps. Tea is brewing and so is murder…” – back cover. Archie Green and his friends have been rewritng the magic spells contained within books, but someone is using their power for evil. “There’s a strange magic to London parks. When the sun sets and the gates are closed, tiny winged creatures come to life. The only way to meet them is to become one. And if you become one, there’s no way back. Rowan cries herself to sleep in Hyde Park and wakes up ten centimetres tall, with tiny oak-leaf wings. She’s about to go on an adventure in the hidden world of fairies and foxes. But Rowan’s quest will be perilous, with fearsome enemies at her heels. If she wants to get home, she’ll need to find the courage she never knew she had, and discover powers she’d never even imagined …” — Back cover. If it were up to Mattie Markham, there would be a law that said your family wasn’t allowed to move in the middle of the school year. After all, sixth grade is hard enough without wondering if you’ll be able to make new friends or worrying that the kids in Pennsylvania won’t like your North Carolina accent. But when Mattie meets her next-door neighbor and classmate, she begins to think maybe she was silly to fear being the “new girl.” Agnes is like no one Mattie has ever met — she’s curious, hilarious, smart, and makes up the best games. If winter break is anything to go by, the rest of the school year should be a breeze. Only it isn’t, because when vacation ends and school starts, Mattie realizes something: At school Agnes is known as the weird girl who no one likes. All Mattie wants is to fit in (okay, and maybe be a little popular too), but is that worth ending her friendship with Agnes? This book was actually not quite good. In other words boring. It is about a girl called Sophie who’s city wants to burn all kinds of old-fashioned books. And her dad has a bookshop that has mostly….. yup, you guessed it old-fashioned books. So it’s a story about how she saves the book with Peter Nimble. I’m not sure if you’ll like it or not. But I definitely don’t. Harry Potter in the Non-Fiction section? What’s going on? As the new Harry Potter book came out in the format of a play, or script, it can be found with other theatrical greats in the literature section where the other plays hang out. The play version of The Witches by Roald Dahl hangs out there along with Shakespeare! Take part in a competition to celebrate NZ Bookshop day. Bookshops are really important – they give you access to a huge range of amazing reading materials that you can fill your house and bedroom with. People who write and illustrate books use bookshops to sell their books and make money, so they can then write and illustrate even more books. So the more often you use your local bookshop, the more books can be created, and that’s an awesome thing. 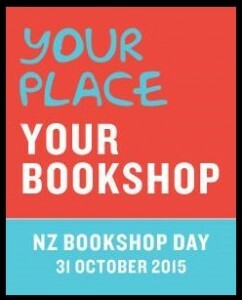 NZ Bookshop Day is on Saturday 31st October (yup – same day as Halloween). To celebrate and get people involved they are running a photo competition. It’s really easy – just snap a funny and entertaining picture of yourself reading anywhere and any way, and upload it here. The best photo will win their height in books, and the 2nd best photo will win their knee-height in books. That’s a lot of books! Get reading, get snapping, and get into your local bookshop. (Entries close 29th October at 5pm).